Although quite tame by today’s "sport boat" standards, the S-2 7.9 was designed as a high-performance model intended to compete, in the marketplace at least, with other boats of its era such as the J-24, Olson 25, and Evelyn 26. Like her competition, the S2 7.9 provides exhilarating sailing performance and has the added benefit of sufficient accommodations to make occasional weekend cruises or overnight races tolerable at least. The 7.9 was designed for S2 Yachts by Scott Graham and Eric Schlageter. The 1982 model year was introduced in late 1981 and was originally marketed as the "Grand Slam," although that designator was later dropped, and the model was simply known as the S2 7.9. It remained in production until S2 ceased production of all its models in 1986. By special arrangement with Tiara Yachts, the parent corporation of S2 Yachts, a limited production of the 7.9 was made available in 1990 and again in 1994 with a total of 545 hulls built over these production periods. The model name 7.9 is actually a measurement of overall length in meters, which translates to 25’11" not including the outboard rudder. The waterline length is 21’8". Maximum draft is 5-feet which, with a retractable keel, reduces to just slightly over 1-foot with the keel raised. Maximum beam is 9-feet, and displacement is 4,250 pounds. A limited number of 7.9s was produced with a fixed keel rather than the retractable keel/dagger board. The keel weight was increased and internal ballast eliminated resulting in a slightly lower displacement of 4,050 pounds. The shallow draft of the 7.9 would seem to make her ideally suited to trailering; however, the nine-foot beam exceeds all state load width requirements (without special permit) and is therefore not "street legal." Nonetheless, many, if not most, models were sold with trailers and are commonly transported over the road by owners who choose to disregard the few extra inches. I have never known of an owner being ticketed for this violation. Both the hull and deck of the 7.9 are constructed of hand-laid fiberglass with balsa wood core material throughout. Construction details and craftsmanship are generally excellent. The deck and hull are joined on an inward flange and secured with stainless steel screws through an extruded aluminum toe rail. This method of joining the deck and hull is inferior to nuts and bolts, is prone to leaking, and will need attention from time to time. Deck hardware is attached with stainless steel nuts, bolts and washers, and backing plates are used at lifeline stanchions. The balsa cored decks and cabin top are also subject to leaks at hardware attachment points particularly on boats that have been raced extensively. Fittings should be carefully maintained to prevent water from penetrating and deteriorating the balsa wood core material. There are always going to be restrictions and deck hazards on any 26-footer, but inboard shrouds, wide side decks and a moderately sized foredeck make getting about the 7.9 quite easy. There are good-sized primary winches on each side of the cockpit for handling jib and genoa sheets and adequately sized secondary winches on the cabin top port and starboard of the companionway for halyards and spinnaker sheets. The cockpit is nearly eight-feet long with a tiller steered outboard rudder and mainsheet traveler just forward of the tiller for easy handling by the helmsman. There are 26’ cruisers with standing headroom and better accommodations than the S2 7.9, but accommodations on this model are a far cry better than many performance oriented boats in this size range. There is a V-berth forward, which is actually suitable for two average-sized adults. Along the port side and adjacent to the dagger board trunk, there is a barely useable galley area, and to the starboard side is a combination head/hanging locker with porta-potti and no ventilation. There are large port and starboard quarter berths aft and 5’5" headroom in the cabin just forward of the companionway. Original buyers were offered optional 7.5 hp BMW or Yanmar inboard diesel engines at an extra cost of over $5,000. Most buyers were inclined to opt for outboard power at a cost well under $2,000. An 8 hp outboard is the minimum required for acceptable all around performance. The 7.9 is a stable and stiff fractionally rigged sloop that is a proven competitor in MORC, PHRF, and one-design fleets nationwide. 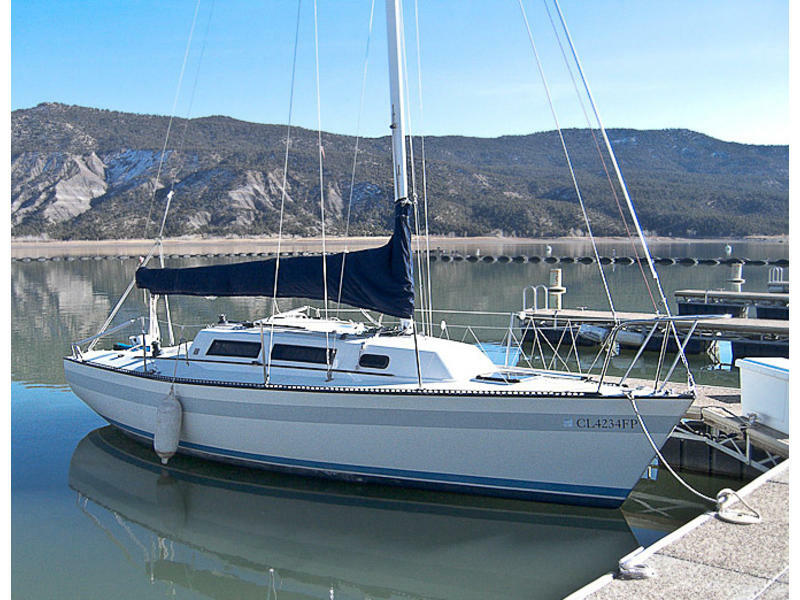 She is also a very able daysailer and small weekend cruiser. The displacement/length ratio of 186 and sail area/displacement ratio of 19.83 are again moderate by today’s standards but sufficient for lively performance without white-knuckle excitement. Like most boats of this type, with narrow entries forward and broad stern, the 7.9 is best sailed as flat as possible and will tend to round up when overpowered but is otherwise well mannered. Originally the S2 7.9 was intended as a MORC and handicap club racer for which she still enjoys considerable popularity. However, the design became so popular that an active one-design class has developed with more than 20 fleets around the country. Still many owners choose not to race their boats at all. No matter what your cup of tea, day sailing, weekend cruising, competitive sailing, or a combination of all the above, the S2 7.9 has a lot to offer.